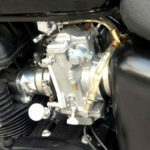 I purchased the Mikuni Carb upgrade kit from Bonneville Performance in April of 2013 for my 2008 Triumph Bonneville Black. 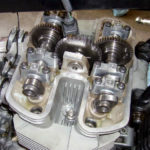 I had already maxxed out the performance modifications that are possible with the OEM Keihin CVK carb, and I was looking for more. 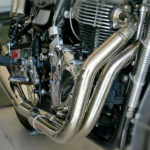 A Bonneville Performance Street Tracker caught my eye at the International Motorcycle Show in Chicago, and I visited the Bonneville Performance website to discover the wide range of Triumph Bonneville performance products and services they offer. 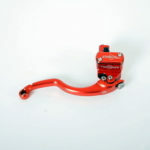 Although I had some initial trouble due to some damage to the carb kit during shipping (choke assembly and throttle cable connector), I found owner Bill Gately to be extremely available and helpful to not only get the broken pieces shipped to me for replacement, but also to offer me helpful insights and suggestions for my specific modification and installation. Several times he walked me step by step through some installation and tuning procedures while on the phone with me. That’s what I call a good customer experience! 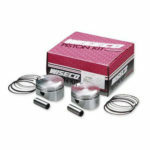 I have really enjoyed the extra horsepower and torque this kit has produced, as well as the instant response that flat side carbs give compared to the floating pistons driven by vacuum, in the original OEM Keihin’s. I plan to have my Bonneville Dyno’d in the spring of 2014 to measure just how much extra performance I have gained. 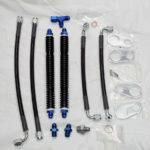 I have recently ordered the Oil Cooler Kit in the anodized black finish and I look forward to installing that kit this spring. 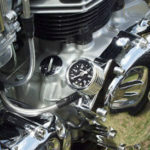 I highly recommend Bonneville Performance parts, kits and services to any serious Triumph Bonneville owner who wants to get the most performance out of this great modern classic machine! I would be very interested to hear the results of your dyno testing of your Mikuni carb conversion. I am particularly interested in the low to medium rev range. 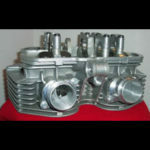 I have often wondered if these carbs are too big for an 865cc engine and whether you will lose any low speed torque. 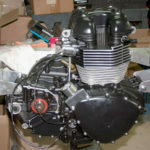 Do you intend to refit the original carbs for a comparative test. Here are the results of a 3-pass dyno run performed May 21, 2016 at the Spring Open House of Team Triumph in Janesville, WI. This was done before I switched out the Mikuni HSR42’s to HSR45’s and before I had the engine completely dialed in. Even so you can see the RW HP in the 90-92 range and the RW torque in the 70-72 range. As soon as I can, I will run it again with the Mikuni 45’s and having it much more dialed in.